Alabama Librarians, it’s that time of year again! The time of year when we honor an amazing colleague for their great work. What a fantastic way to let our colleagues know that they’re appreciated! Do you know a stellar Alabama librarian? Would you like to honor them? Then nominate them for the Beta Phi Mu Librarian of the Year Award! 4. has actively contributed to the profession through publishing, professional association work, research and/or leadership within their community. We welcome your nominations and look forward to hearing from you! To nominate a librarian for this award, please fill out this form with a short testimonial! Each year in April, we welcome new members to our society. This year, we are happy to welcome the following initiates to Beta Kappa Chapter! Congratulations to Wendy Stephens, Beta Kappa Chapter’s Librarian of the Year! Beta Kappa Chapter is overjoyed this year to announce our librarian of the year, Dr. Wendy Stephens. Wendy’s contribution to the state and to the profession through her work with School Media Specialists in Alabama has made our state a better place. For most of the past decade, Wendy has worked as a school media specialist at Buckhorn High School and then as district coordinator and school librarian at Cullman High School. During this time, she also served in various roles of state and national leadership, including president of the Alabama Library Association during 2015. She has been recognized for her excellence in library media work nationally, including by The Educators of School Librarians Section of the American Association of School Librarians. Wendy has recently accepted the position of Chair of the Library Media Program at Jacksonville State University, and we look forward to seeing her continue to have a positive impact on school media librarianship in the state of Alabama! Congratulations Dr. Annabel Stephens, Winner of the 2016 ALA Beta Phi Mu Award! Please join me in extending a heartfelt congratulations to Dr. Annabel K. Stephens for winning the 2016 ALA Beta Phi Mu Award. Within the state of Alabama and across the country, librarians have been touched by Dr. Stephens through her work as an LIS educator, a scholar, a mentor, and a benefactor. Her long, distinguished career and her unbounded energy as well has her generosity of spirit make her an excellent candidate for this award. It would be difficult to find a public library in the state of Alabama that does not benefit from Dr. Stephens’ influence, and her students hold leadership positions in public libraries across the country. Throughout her career, she has positioned herself as mentor and friend, supporting librarians as they serve their communities, finding ways to encourage them as they face difficult political and financial situations within their libraries, and always advocating respect and dignity for all as a service model. She has changed the face of the rural public library, empowering directors with little access to formal LIS education to get their degrees. While Dr. Stephens’ reach is far and wide, I believe that most of her students would remark on the personal connections that she builds with her students. She demonstrates the model that she advocates, treating all of her students with genuine warmth, and she always finds time for them when they need her. Even in retirement, she continues to build personal relationships with her students, encouraging them to live generously and to be passionate about their work. Supporting her long and active career in the classroom is Dr. Stephens’ strong record of scholarship. Her passion and commitment to public libraries extends throughout her career, as is exhibited by the books and articles that she has authored, including Public Library Collection Development in the Information Age and Assessing the Public Library Planning Process. In addition to her scholarship in collection development and planning, Dr. Stephens has a completed important research to promote diversity in library services and development, advocating that public libraries include outreach to marginalized communities such as the Latino community, the LGBTQ community, and the homeless. Annabel Stephens’ record of service illustrates her dedication to her profession, to her university, and to her community. Dr. Stephens continues to serve on the American Library Association Committee on Accreditation External Review Panel, chairing the committee 3 times in the past decade. She served as Faculty Advisor for GLBQ (now LGBTQ) for two decades, on various University diversity committees, and served as a member of faculty senate for a number of years. Throughout her career, she tirelessly served the Alabama Library Association, chairing the Scholarship Committee and the Continuing Education Committee for several years. She continues to actively advocate for Alabama public libraries through service on the Alabama Library Association’s Legislative Committee. Her leadership and expertise in public librarianship throughout her career is evidenced by her numerous invited speaking engagements across the southeast. Dr. Stephens’ service record extends beyond her campus and her profession into the community, where she has served on the board of directors for West Alabama AIDS Outreach. For years she has volunteered with the Food Pantry at University Presbyterian Church, Hospice of West Alabama, and at Turning Point (a domestic violence and sexual assault agency). Congratulations, Dr. Annabel Stephens! We are so glad you are in Alabama. Thank you for everything you do for us! It is that time of year again, my friends! Do you know a stellar Alabama librarian? Would you like to honor them? Then follow this link to nominate them for the Beta Phi Mu Librarian of the Year Award! Please help us recognize those dedicated and passionate leaders in our state by nominating them for Librarian of the Year! 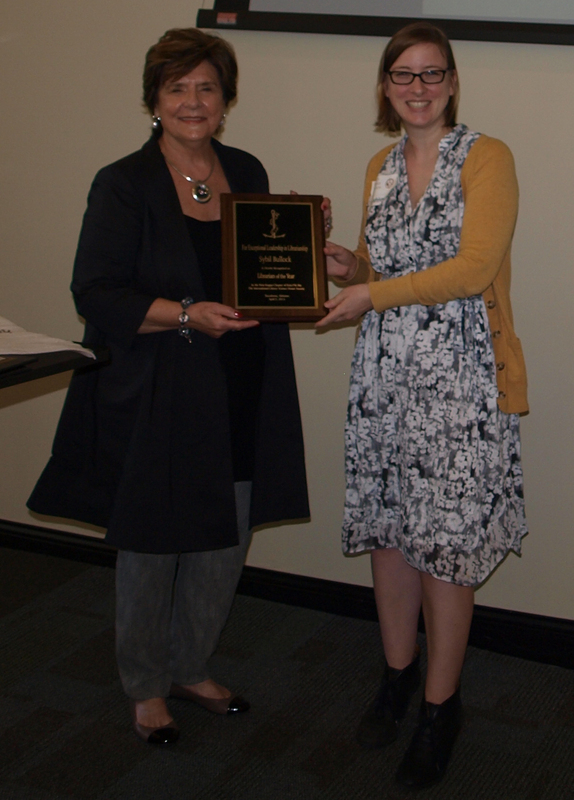 Congratulations to Professor Sybil Bullock, 2015 Beta Kappa Chapter Librarian of the Year! It is an honor and a privilege to announce that our 2015 Beta Kappa Chapter Librarian of the Year award goes to Professor Sybil Bullock. Professor Bullock has touched so many lives and made such a difference in the landscape of Alabama Libraries. Professor Sybil Bullock, thank you for everything you have done for us! After graduating from UA SLIS, Sybil accepted a position directing the scientific and technical research center at Redstone Arsenal (RSIC) in Huntsville. Upon retiring from that position, she returned to school to get an Ed. S and began adjuncting at SLIS, as well as serving as a consultant for medical libraries across the country. In her work in federal and medical libraries, Sybil has developed an amazing network that she draws on to benefit UA SLIS students interested in special, science, and medical librarianship. I first worked with Sybil as a SLIS student seeking an internship. I actually completed 2 internships, both facilitated by Sybil. Both were incredible learning experiences. From the moment of contact with Sybil to the last detail of paperwork, my experience was simple and straight-forward. I knew what I had to do to register, and what I had to turn in. The facilitation of the logistics of my internships made it easy for me to focus on the content of the internships, and really have authentic learning experiences. Since then, I have worked with Sybil almost every semester, hosting interns. the internship experience was so valuable to me that I wanted to pay it forward. And in every case, Sybil has made the hosting experience incredibly easy. My interns have never had any trouble getting registered. I always have plenty of notice on evaluation due dates. Everything goes so smoothly. And I am impressed, because I know she facilitates a number of internships every semester and during the summer. An advocate for special librarians, particularly those with interests in science, technology, engineering, and medicine (STEM), Ms. Bullock has mentored many beginners and coached numerous mid-career librarians…If positive influence in Alabama librarianship is a criterion for this award, there is no more deserving candidate for this honor than Sybil H. Bullock. Sybil is a powerhouse in the classroom. She brings to students her extensive experience as a special librarian in a number of science/ technology settings [Director, Redstone Scientific Information Center @ Redstone Arsenal in Huntsville, AL; ARMY Aeromedical Research Lab, Fort Rucker, AL; and others]. She is dynamic in her presentation style and her personality is as commanding as her experience in the field. There is no mistaking her southern roots, or her allegiance to The University of Alabama and their athletic teams. Her contribution to my personal education was significant, and I know she continues to deliver great value to her students at SLIS. I can’t speak highly enough of Dr. Bullock – I am not the only student who has leaned on her extensively for support with school projects, personal research, student groups, internship placement, job searching, interview preparation, on-campus issues, etc., etc., etc. We heard from many others who shared equal enthusiasm and praise for the work that Sybil Bullock does. To this end, it is my pleasure to name you Beta Phi Mu Beta Kappa’s 2015 Librarian of the Year, in recognition of your steadfast commitment and loyalty to UA’s SLIS students and alumni, and to librarians across Alabama.